Pimpaka Towira with her Asian Future Award at the Tokyo International Film Festival. Photo via The Nation. Though she's been making films since the late 1990s, it's taken awhile for the men in charge of world cinema to get around to recognizing Pimpaka Towira, who was honored over the weekend at the Tokyo International Film Festival with the Asian Future Award for her new film The Island Funeral (มหาสมุทรและสุสาน, Maha Samut Lae Susaan). It's her sophomore fictional feature, which follows her 2003 debut One Night Husband and the 2007 documentary The Truth Be Told: The Cases Against Supinya Klangnarong. Of course, Pimpaka has also been kept quite busy over the years making short films, producing films by other directors, lending her expertise to workshops and serving as a festival programmer, juror and panelist. The award for her new film seems quite overdue, but is still most welcome. "I am so excited right now. The film took so many years to complete. 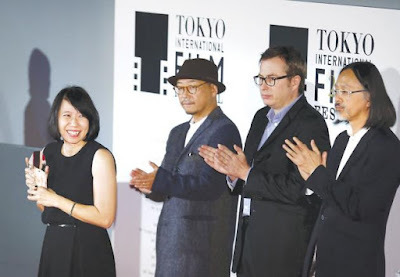 I'd like to thank the Tokyo International Film Festival and all the crew and the actors who made the big effort until we could finish this project," Pimpaka said in her acceptance speech. The film tells the story of Laila, a Muslim woman from Bangkok who travels to Pattani to meet her long lost aunt. "I was not sure initially as my film was different from other films, but the feedback from the audience was very nice," Pimpaka said later in an interview. After One Night Husband, which premiered in the Forum Section of the Berlin International Film Festival in 2003, she had to put in a lot of effort to make her second feature. "During the production stages, I was not sure if this film was good enough. I had to revise the editing so many times. The award proves that at least the jury and the audience saw something in this film," said Pimpaka, whose film was praised by the jury for showing the landscape and politics of the country with strong cinematic language. The jury members were Olivier Pere, managing director of Arte France Cinema, Jacob Wong of the Hong Kong International Film Festival and Tatsushi Omori, director of the critically acclaimed Japanese film The Ravine of Goodbye. Shot partially in Pattani with 16mm film, The Island Funeral went through a lot of problems and was almost left unfinished. "At one point, I didn’t feel like I wanted to finish the project. There were lots of problems, from myself, from the source of funding, and what happened around me, but in the end I made a decision to finish the film even though the result was unforeseeable." The Island Funeral premiered in Tokyo alongside another new Thai film, Kongdej Jaturanrasmee's Snap, which will open the upcoming 13th World Film Festival of Bangkok. Folks in Thailand will have to wait awhile for The Island Funeral though. Pimpaka and her team plan to tour the festival circuit for the next year or so, building up more anticipation for the film's eventual Thai release. There's more about the film in another article in The Nation. Elsewhere in the festival world, the short film That Day of the Month was among the prize winners at the 19th edition of Queer Lisboa, which was held in September. Thanks to a Facebook reader for sending me the tip about this one. Directed by Jirassaya Wongsutin, That Day of the Month was named the Queer Lisboa's best short film, winning a 1,500-euro prize and Portugal's RTP2 public TV channel picking up broadcast rights. Jirassaya had previously won the White Elephant Award for student films at last year's Thai Short Film and Video Festival. Finally, here's news of an upcoming Thai film screening overseas – Bangkok in Motion, a short directed by Bangkok-based filmmaker Jimmie Wing – has been selected for the Toronto International Short Film Festival, which runs from November 11 to 13. It's a smoothly rolling portrait of Bangkok, shot from the perspective of a disabled cameraman in a wheelchair. I found out about this one because Jimmie saw me at a film event, and actually walked over and spoke to me. He told me that his short film was going to be in the film festival in Toronto. So now I've reported that news here. Funny how that works.